The Body Shop Almond Milk & Honey Collection. 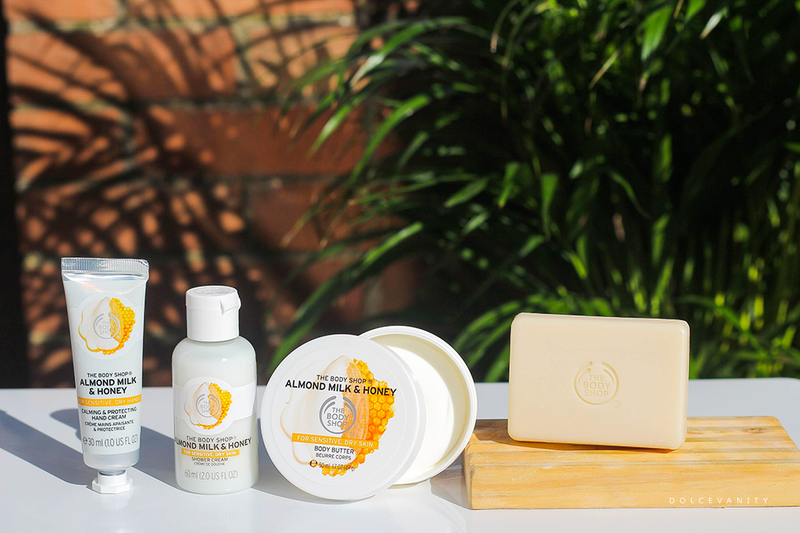 I often look forward to seeing what new releases The Body Shop has to offer and one of their latest ones launches is The Body Shop Almond Milk & Honey Collection, with organic almond milk formulated for sensitive skin, to help soothe any signs of irritation, redness, dehydration and dryness. The combination of milk & honey isn't new - just depends on what type of milk you use. This contains almond milk and almonds are an amazing source of Vitamin E which is very hydrating for the skin, well known antioxidant therefore it prevents ageing by protecting the skin from free radicals. Although I don't suffer from dry skin, I like to keep it very moisturised. Within the little bundle I got to try is the, Calming & Protection Hand Cream, Shower Cream, Body Butter & Cleansing Bar. All these are easy on the skin, nothing is drying as it shouldn't be even down to the cleansing bar. Which I love, since last year I've really got back into cleansing bars. My body doesn't dry out that easily unless I'm using something very drying - high in alcohol, the fact this is for dry + sensitive skin doesn't bother my skin. Body butters are a favourite of mine, they moisturise and give the skin a nice gleam and this one is the small tub good for travelling or the handbag. Have you tried this collection? Are there any from The Body Shop that you recommend? These must smell fabulous I would love to try that body butter! I haven't tried any of this range yet. I bet they smell amazing! The body shop is fantastic I love their products! These look like something I need in my life!